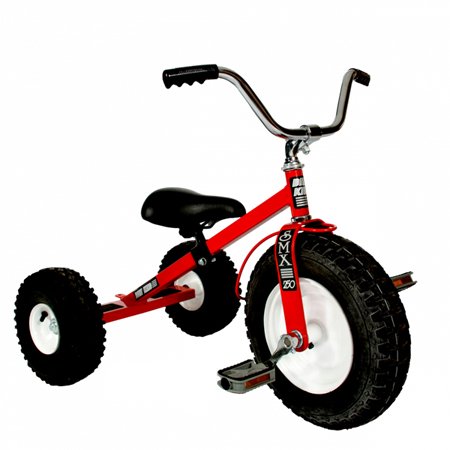 The World's Best Tricycle for children is virtually indestructible! Often purchased by day care centers because the Dirk King Trike is built to last. Built strong and sturdy for rough and tough riding by boys and girls over rough as well as smooth terrain. This is not a wimpy tricycle! The Dirt King Trike is constructed of 14 and 16 guage, hand welded steel and then painted with a powder boat for a tough finish. Tires are mounted on heavy duty steel rims with 5/8" steel ball bearings. Dirt King uses air filled floatation that make driveways and sidewalks that are broken and uneven as well as gravel easy and smooth to navigate. The tires are over-sized and air filled. Combine the tires with the 5/8" steel ball bearings and you have a trike designed to roll and ride over any terrain providing a smooth ride over grass, gravel, broken pavement a breeze. The Dirt King trike design positions the adjustable seat higher than the rear wheels and slightly below the front wheel again for a smoother ride. 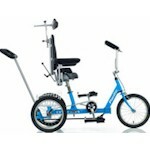 The over-sized front wheel is designed to improve maneuverability for smaller children.